I have started a campaign for greater allotment provision across the new Ards and North Down Council Borough. Highlighting the issue at a recent Council Committee meeting, I outlined that allotments are not only good for an individual’s mental and physical health, but, if tended correctly, could help local people save money of their weekly supermarket shop. As our town continues to develop, allotments provide a much needed green space for many to enjoy. For example, whilst Bangor is Northern Ireland's largest Town accommodating over 59,000 people, limited allotment provision exists denying many people living in premises with small or no gardens the opportunity to grow their own. 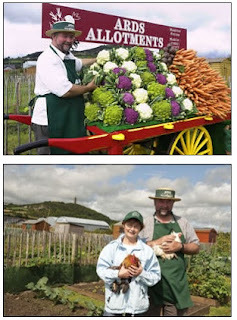 Newtownards, meanwhile, has Ards Allotments on the Comber Road providing plots for local people to enjoy with a vibrant community atmosphere as I witnessed a few weeks ago during their Open Day Event. There are so many benefits to tending an allotment. Not only is it great exercise and can help boost your exposure to the Sun, but through time spent they can also help reduce a households expenditure. But looking beyond the benefits to ourselves, allotments are also essential in helping local wildlife grow and develop. In cultivating an allotment you are helping to keep biodiversity levels buoyant and continually protecting out eco system. I’m delighted other Councillors were able to get behind my proposal and look forward to the report that comes back from Council staff as we begin to move forward in increasing allotment provision across the borough.